I’ve been traveling for the last little while, a trip down south on business followed by another throughout Nunavut. The logistics of traveling in the Arctic means that nothing is straightforward. This past week, for three days of meetings in Cambridge Bay, I was on the road for eight days including a foray into the Northwest Territories capital of Yellowknife. Of course “on the road” is metaphorical as the only highway in Nunavut links my home with the no longer existent community of Nanisivik. Mostly I was in the air. As most of you know the Great Backyard Bird Count was on the weekend before last starting on the day I left, the 17th of February. I’m pretty sure that I set some sort of record for the count, for the greatest area covered by a single observer in a single year. My count encompassed three communities, separated by some 2900 air kilometres. If was to calculate the area between my three count communities (and you know I have) it would be over 490,000 square kilometres. Or if you’d prefer over 190,000 square miles. I would have added a fourth community to the count, but weather prevented us from landing in Rankin Inlet. It appears as though I have a big backyard. I left for the airport in Arctic Bay Friday morning, and saw nothing on the drive there. Remember our sun has been back for less than two weeks (note to self: It is time to find your sunglasses), so even though it was shortly before eight am it was still dark out. The airport is a little ways from town, away from the bulk of the Ravens around this time of year, and I spent most of my time at the airport staring out the window. Nothing (which is an acceptable count result). However as we were taking off I saw a pair of Ravens flying along the hills in the gathering light. 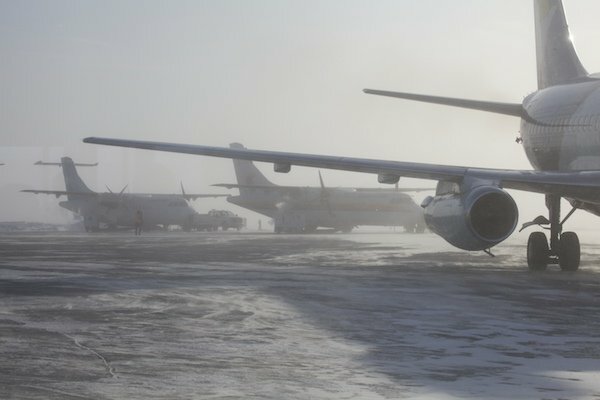 I had two nights in Iqaluit waiting for my next (and endlessly delayed) flight so I managed to get in three days worth of counts there, which included a surprise and my favourite moment in the weekend’s count. I was sitting in my hotel room doing a backyard count in (almost) the strictest sense. My hotel looked over a parking lot and lane way and I sat there watching a loader clearing out the lot. The GBBC requires that you submit the count of most individuals you can see at any one time. Designed to encompass people watching feeders, it is set up that way to avoid counting the same individual more than once. If, while doing your count, you saw five Black-capped Chickadees at your feeder, a little later three of them, and later still four, you would submit five Black-capped Chickadees in your count. There was a large group of Ravens the next street over interested in something, but mostly hidden by buildings. I was entertaining myself (Ravens are always entertaining in their own right) by trying to see just how many I could see at any one time. Some would fly up and perch or wheel around, I’d madly count as many as I could before they’d disappear, scanning the skyline for others. Then start over. I had almost tired of the game and was thinking that I should try and find out where the Snow Bunting that had been seen the previous week was and go find it, when four small passerines flew over the building next door. They settled on a shed across the lane and a couple flew down to the ground. I dug my binoculars out of my suitcase to find that it was a group of four Hoary Redpolls. I watched them for a short while before loader guy came back and scared them off. It was an unexpected sighting in downtown Iqaluit and serendipitous for my bird count. Like a bird, a on rock. 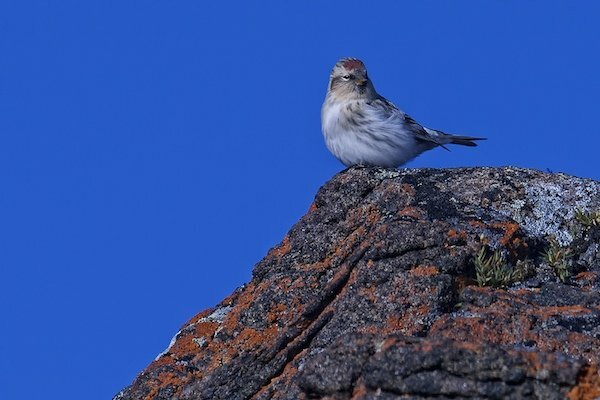 Oh, if any eBird, GBBC, or CBC bigwigs are reading this, Hoary Redpolls winter in the Arctic and High Arctic. Stop telling me its an unusual occurence. I completed my trifecta of GBBC counts in Cambridge Bay in the Kitikmeot region of Nunavut on the Monday. Again adding more Ravens to the count. All in all it probably added up to one of the most widespread series of GBBC counts in its history. For those of you interested in the somewhat mind boggling distances up here my trip home was rather lengthy. 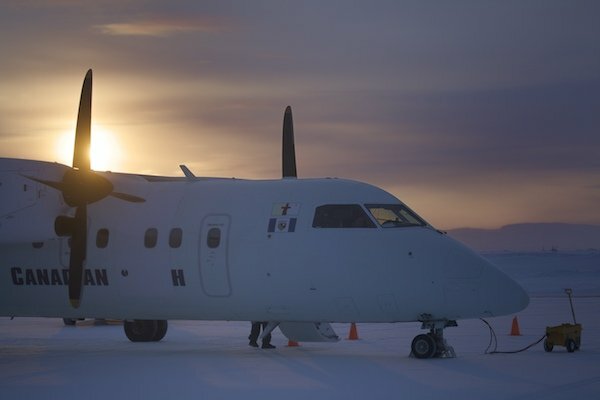 Although Cambridge Bay is only 840 kilometres (520 miles) from home here in Arctic Bay, the trip back took three day and I hit eight communities. On my second leg of the journey, two stops after leaving Cambridge Bay I was only 490 kilometres (305 miles) from home. But my total distance in the air for the return flight was 5367 kilometres or 3,335 miles. It really is about the journey I guess. Half a million square kilometres? Yupp, sounds big. Please, don’t try to mow the lawn. And that’s a very fine travel narrative, and a very beautiful picture of a Hoary, one of my favourite bird species. Thanks! @Jochen, its not so much the mowing of the lawn, its that privacy fence I’m installing that is causing all the headaches.